New to holiday rentals this 2 bedroom apartment has been fully refurbished to a very high standard and is centrally located within Puerto del Carmen, also within walking distance of the old town and harbour. Its enviable frontline position means you are only 50 metres from the beach and promenade, yet set back far enough to enjoy the peaceful and secure complex with pool and mature gardens. The spectacular contemporary lounge includes comfy corner sofa, flatscreen TV with British channels inc. BBC,ITV, RTE, SKY Sports, Movies, free WiFi and bluetooth sound system. The large sunny balcony enjoys sea, pool and mountain views and is equipped with rattan dining furniture for alfresco dining. The brand new fully equipped kitchen benefits from washing machine, large oven, fridge and microwave. The stunning refurbished bathroom has a walk in power shower, towels are provided and complementary toiletries. The master bedroom has a KING size bed and bedroom 2 has twin beds - all have quality mattresses and bedding. Air-conditioning has been installed throughout the apartment and is operated by a meter, should you require it. There is also a safety deposit box. This apartment provides a high specification finish for all your holiday requirements and comforts. A perfect location for all ages. Although there are ramps throughout the complex we would not recommend the property to wheelchair users or those with reduced mobility due to there being a few steps into the apartment itself. The apartment is owned by a UK family of four who regularly holiday here. It is managed by Dean and Gill Lee, who have lived on the Island for many years and own and operate Sovereign Property Management. They have an excellent reputation for quality of service and are on hand should you have any queries or concerns during your stay. The outstanding comments in the guest book are testament to the cleanliness of the apartment and service provided. The owners have another frontline apartment 100 metres away along the Avenida. It too has been fully refurbished to an equally high standard. If this apartment is not available on the dates you require, please consider property ref: C6147. Newly refurbished Bathroom, fully tiled, modern clean lines, large walk-in shower enclosure. Wash basin with built in storage. WC. Mirror with lighting. Hair dryer. Power points. payable locally by coin operated meter, if required. The lounge is furnished to a very high standard inc. large L shaped settee, large flat screen TV with BBC, ITV, RTE, Sky sports, free movies, free WIFi and Bluetooth speaker. Newly fitted and refurbished modern kitchen with double oven and hob, kettle, microwave, toaster, fridge, washing machine, cutlery, plates, cups and all cooking utensils. Complex set in well maintained mature gardens, very peaceful and beautiful. Lanzarote has two golf courses, the nearest is in Tias 10 minutes in taxi. The other course is in Costa Teguise about 30 minutes drive. Well maintained figure of 8 shaped pool with bridge and deep/shallow ends. Four reserved sun beds by pool. Notes on accommodation: Strictly no smoking inside the apartment. Ashtrays are provided and may be used on the terraces. There is a small hidden safe available for use at no extra cost. However if key is lost, a small fee will be payable to replace it. Free internet access with security codes only for use by this apartment. Outside: South facing terrace: table & 4 chairs for alfresco dining. Beautiful sea, pool & mountain views. Four reserved sunbeds for use around the pool area. Sun shade umbrella provided for those long hot sunny days! The figure of 8 pool area is well maintained and has a shallow end for children. Cleaning / Towels / Linen / Maid service: Towels & linen included. The property is cleaned for your arrival with a change of towels & linen after 7 days. Pool/beach towels are supplied, we just ask that you wash them before you leave. Extra cleaning can be arranged if required. 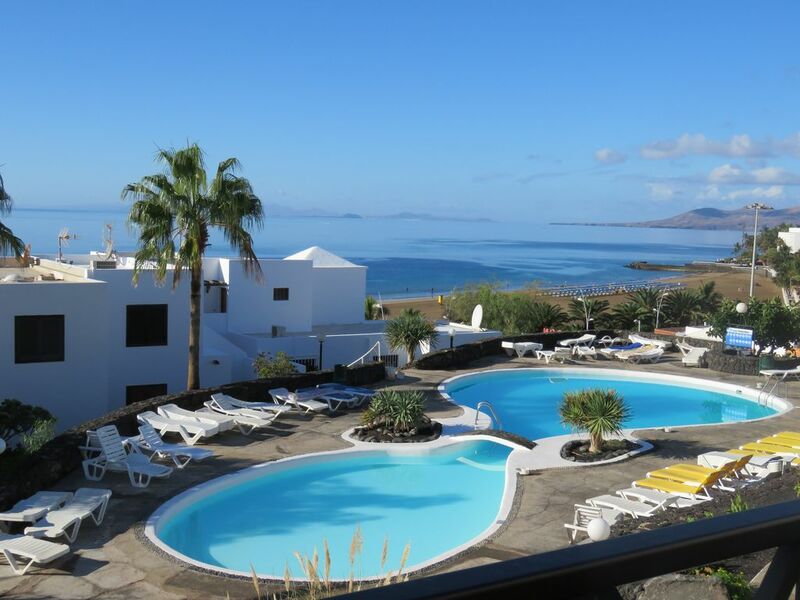 This apartment is one of the best you will find in Lanzarote. Ideally placed for all bars/restaurants/shops and beaches. Old town nearby too, for some great restaurants. The apartment itself is fantastic, very modern, clean and the rooms are a perfect size. ; shower is superb as is kitchen area. Beach towels provided which is a bonus, as are the sun loungers. TV with Sky and BT sports means you'll never miss a game too! The views are excellent, as per the photos and it really is a home from home, amazingly quiet considering how close to the Avenida it is. You may find slightly cheaper apartments on this complex, but I would highly recommend this one. Dean was excellent to deal with too. A perfect relaxing week. Will look to stay here again, but will need to book early I think as it is very popular! This is an excellent apartment which has stunning views. It is set just off the promenade but is extremely quiet. The interior is spacious and offers well presented furniture and facilities especially the bathroom/walk in shower, which delighted us. The TV has an amazing range of options with tv channels galore,films,and music etc. A special thanks to Dean for his patience and prompt response when we had internet problems. Just one note -- the access to the complex and apartment is via a fairly steep slope and steps. We do not hesitate to recommend this apartment and have already booked for next year. Puerto del Carmen is the largest and most popular resort in Lanzarote. Only a 10 minute drive from Arrecife airport it stretches the full 6km of golden sandy Blue Flag beaches and coves lined with bars, restaurants and shops. It was originally a small fishing village and the old town and harbour, within walking distance of the apartment, offers excellent fish restaurants with stunning views. If you can drag yourself away from the beach there are many activities to enjoy. There are a number of diving schools within walking distance as well as windsurfing and paragliding. The many rocky coves along the seafront offer excellent snorkelling opportunities with plentiful tropical fish. The apartment is ideally located to enjoy all the Puerto del Carmen has to offer on foot, however, for those that want to explore further afield we highly recommend a drive to Papagayo Beach nature reserve or Timanfaya National Park for the tour of the volcano! Both less than half an hour drive. For those that enjoy shopping, there are plenty of independent shops along the sea front and the Biosfera Plaza Shopping Centre, within walking distance, offers a good selection of clothing shops such as Zara, Levi and Quicksilver. The Lanzarote IronMan triathlon, which is a major international athletics event, starts and finishes on the Avenida de Las Playas, lending an air of excitement to Puerto del Carmen every May / June. There is also a huge carnival every February attracting visitors from all over Europe. Booking Notes: A deposit of £100 per week (non refundable) is required with the balance to be paid six weeks before holiday. Details of how to pay will be given upon booking. Changeover Day: Flexible. Arrivals can access the apartment from 3:00pm Departure is 10:00am unless agreed with our property manager. We will undertake as best as practically possible to accommodate times outside those shown. Notes on prices: Prices are based on 2 people with extra persons charged at a weekly rate of 30.00 pounds per person.